Ending homelessness isn&apos;t just about finding a home. Sometimes, it&apos;s about finding a nice home — a place that&apos;s bright, modern and healthy to live in. That&apos;s the idea fueling the development of a number of buildings around the country, as communities try to move chronically homeless people off the streets. 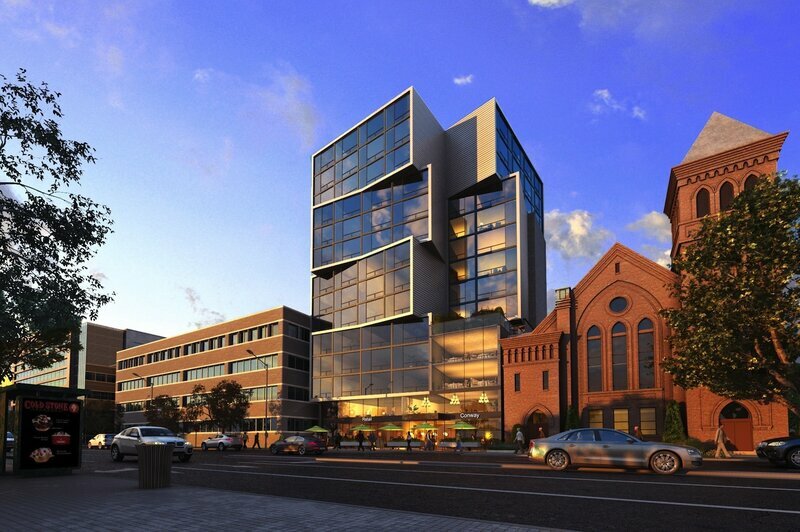 In downtown Washington, D.C., one of those buildings is currently going up right beside NPR&apos;s headquarters. Still under construction, the structure looks a little like four huge blocks, stacked atop each other and slightly askew. At 14 stories high, it will have a striking view of the U.S. Capitol and the Washington Monument when it&apos;s finished. "It&apos;s going to be definitively an inspiring place for the folks that are in it and for this neighborhood as well," says Nadine Maleh, executive director of the Institute for Public Architecture. Until recently, she was the director of inspiring places at the nonprofitCommunity Solutions, one of the groups behind the project. 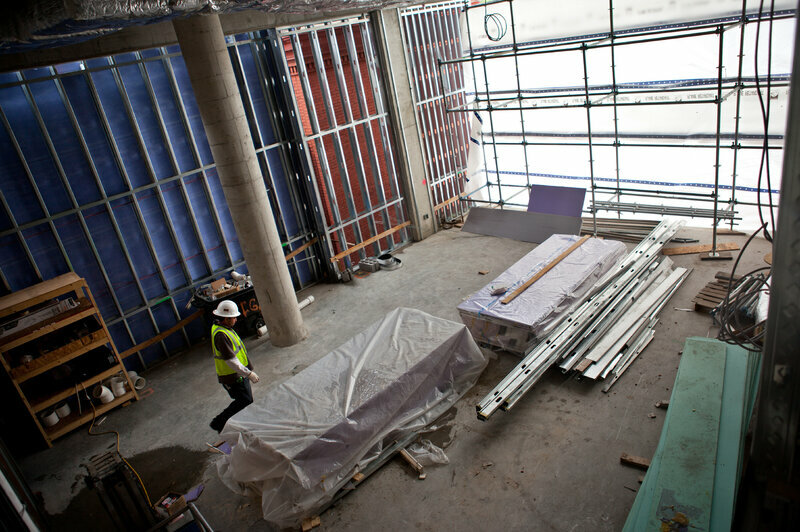 "The front of the building will be predominately glass," Maleh adds, explaining that it&apos;s designed to let in as much natural light as possible. The building will provide permanent housing for 60 homeless veterans and 64 other low-income adults, beginning early next year. Each resident will pay about a third of their income in rent for an efficiency apartment. The building will also have a big, open lobby with a concierge desk, much like many of the other new apartment buildings in the area. "And then we have a lot of really wonderful building amenities which serve to promote community within the building. So there&apos;s a computer room. There&apos;s a gym," Maleh says. Out back there will be a patio, and inside, a room for residents to keep their bikes. Social services, like job counseling and health care referrals, will be offered through an office in-house. There are also plans to build a restaurant or cafe on the ground floor, to help attract others in the community who might be wary about having such a facility in the neighborhood. Maleh says that&apos;s the whole idea behind this place: that people who have the kinds of mental health and other issues that made them homeless in the first place will do better — even thrive — when they live somewhere they feel calm, comfortable and part of a community. For a good example of what this kind of affordable housing can do, just talk to Emily Martiniuk in northern Los Angeles. Martiniuk, 63, lives in the Palo Verde Apartments, a bright, stylish facility with a lot of the same amenities that will be offered at the D.C. building: community rooms, a computer lab, patios and a beautiful tree-lined courtyard. She lives in one of the facility&apos;s 60 units, on the second floor. She&apos;s lived in the building for three years, decorating and redecorating the space with posters, plants and little trinkets. "It&apos;s hunt and pick, because I am low-income," she says with a laugh. This is the dream apartment. I don&apos;t call it my room. Other people call it their room. This is my apartment. For most of her life, Martiniuk eked out a living driving buses, working as a telemarketer and even owning a small notary business. Then things started to slide: One of her adult sons died, then the economy crumpled — and with it, her business. "It was like a slow divorce," she says. Without work, she was no longer able to make ends meet, eventually ending up in a homeless shelter. Her mental health deteriorated, and she was institutionalized for six weeks. Then, she got the opportunity to move to the Palo Verde Apartments — which is when everything changed, she says. "I have a mental health issue. The condition of my home is the condition of my mind." That&apos;s why it&apos;s so important for her mental health and well-being to have this neat apartment as a "sanctuary," as she calls it. There are questions about the cost of these projects, though. 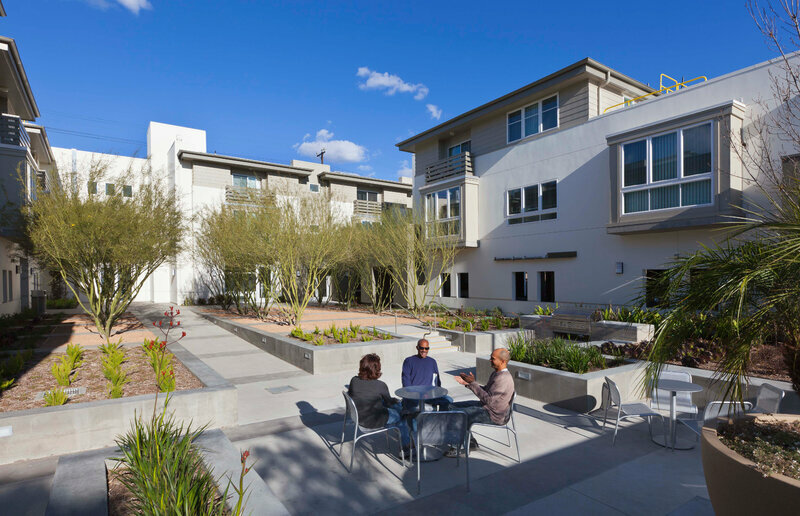 The Palo Verde Apartments cost about $16 million, says Stephanie Klasky-Gamer, president and CEO of LA Family Housing, the nonprofit that owns and operates the facility. And she&apos;s quick to add that the $16 million price tag is more expensive than the typical permanent supportive housing facility — but that&apos;s intentional. "Another developer most likely would have built this [facility] with much higher density," Klasky-Gamer says. "But we elected to have this kind of courtyard. We elected to have little patios and little convening spaces." They elected to do that, she says, because it lets them better serve the people they do house here. It&apos;s quality over quantity. The same idea drives the Washington, D.C., project, which will cost about $33 million to develop. But Klasky-Gamer, Maleh and others insist that it&apos;s cheaper to build facilities such as these than it is to deal with the many problems people have living on the street, like repeatedly going to the emergency room. And that&apos;s why cities and nonprofits have been putting up similar buildings in places such as New York, New Orleans and San Diego. Still, such facilities are addressing only a fraction of the problem. On any given night, there are about 600,000 homeless people living in the U.S. About 44,000 of them live in LA County alone.